Which rotary cutter is right? John Deere rotary cutters lead the way with innovative design, superior performance, and proven durability. 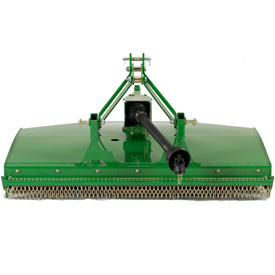 Valuable features are included such as the Double-Decker™ design and Max Flow cutting chamber, which prevent water and debris from accumulating on the smooth, dome-shaped top deck while the flat bottom deck absorbs the punishment from rocks and stumps. The top deck stays smooth - no dents, no dings, no holes. The internal supports sandwiched between the top and bottom decks are key to the smooth and structure-free Max Flow cutting chamber, while at the same time provide added strength and durability. To help promote safe operation, John Deere rotary cutters are equipped with front and rear safety-chain shields. John Deere rotary cutters continue to advance in value with larger, more powerful gearboxes, redesigned blade holders, and updated constant-velocity (CV) drivelines (special to the flex-wing models). Clipping pastures encourages grass growth, optimizing on valuable pasture acreage. Cutting grass and stocks helps control insects. Routine cutting keeps weeds from reseeding. It is the most cost efficient way to cut roadsides, parks, cemeteries, airport fields, hydro, gas, and telephone easements, and all other types of open properties. Cutting grass waterways encourages root development and helps prevent erosion. Knocking down stalks is essential in no-till and minimum-till fields. Shredding stalks such as cotton, corn, and milo speeds up decomposition. Clearing out brush is easy. Use a rotary cutter to control undergrowth and grass in orchards, vineyards, and groves. John Deere rotary cutters are available in three duty-level categories, three different spindle configurations, four hitch types, and three flex-wing sizes. MX models are available in 1.5-m (5-ft), 1.8-m (6-ft), 2.1-m (7-ft), 2.5-m (8-ft), 3.2-m (10-ft), and 4.6-m (15-ft) cut widths. This duty-level category cuts brush up to 50.8 mm (2 in.) in diameter. HX models are available in 3.2-m (10-ft), 4.2-m (14-ft), 4.6-m (15-ft), and 6.1-m (20-ft) cut widths. 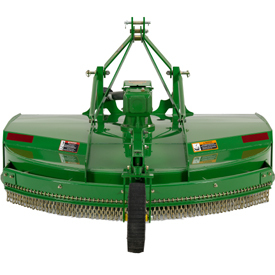 HX6 is available in 1.8-m (6-ft) and the HX7 is available in 2.1-m (7-ft) cut widths; they cut brush up to 101.6 mm (4 in.) in diameter. CX models are available in 3.2-m (10-ft), 4.6-m (15-ft), and 6.1-m (20 ft) cut widths; they cut brush 101.6 mm (4 in.) in diameter. NOTE: CX models are heavier built to cut at a 101.6mm (4 in.) capacity level more frequently and for longer durations. 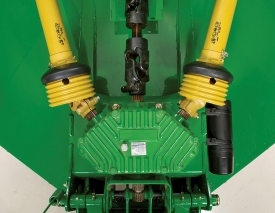 Suction blades provide additional lift action for picking up downed material. The blades are 1.3 cm x 10.2 cm (0.5 in. x 4 in.) in size and heat-treated for long wear life. The fast blade-tip speed ensures clean cutting and fine shredding of material. 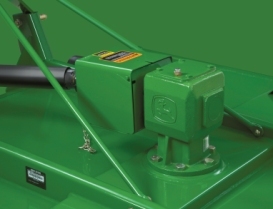 John Deere is so confident in the reliability of the gearbox, the warranty has been extended. John Deere rotary cutters come with a 5-year limited gearbox warranty. 2.25% APR fixed rate for 24 months on New John Deere Rotary Cutters. This kit is available for customers who want to convert from a Category 1 to a Category 2 hitch. 1) MX5 Single-Spindle Rotary Cutters are now being manufactured with holes in the mast plate to facilitate the conversion bracket, but for older MX5 Single-Spindle Rotary Cutters use the conversion bracket as template to drill a hole in the mast plate. A serial number break was not issued for the addition of the hole to the mast plate. 2) MX6 Single-Spindle Rotary Cutters prior to SN 11,001 were manufactured with Category 2 hitches and could not be converted to Category 1. MX6 Single-Spindle Rotary Cutters SN 11,001 and above are Category 1 and the conversion kit does apply. Required for hookup to a tractor with Category 1 or 2 Quik-Coupler hitch. Safety shields are used to reduce the hazard of thrown material. Front chain shields protect the operator, yet still allow uncut material to pass into the cutting chamber with minimal restriction. Front and rear shields are to be used at all times. They are especially critical when working near roads or other public areas.